I thought I would provide some feedback on the battery life of the Samsung Galaxy S5. First test was normal usage, no power saving tricks used whatsoever, screen nice and bright too. I did plenty of podcast listening via wired headphones and or bluetooth music streaming. Not too shabby. 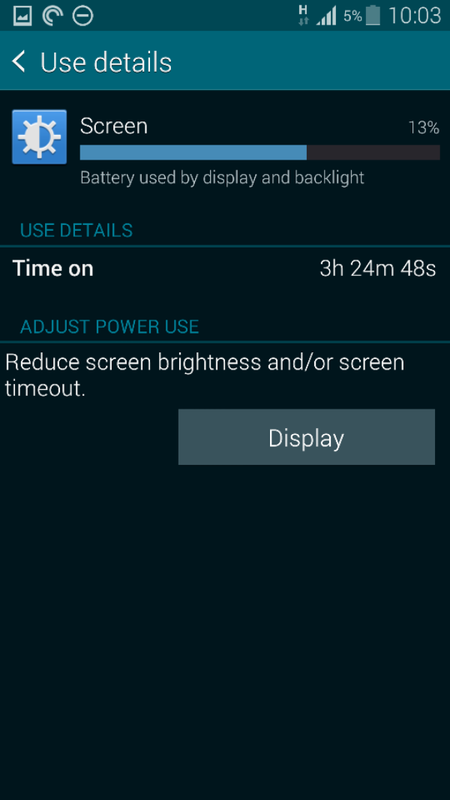 15 hours usage and 4.5 hours screen on time. Also note that my S5 is a power user setup so has everything running in the background and tons of notifications. 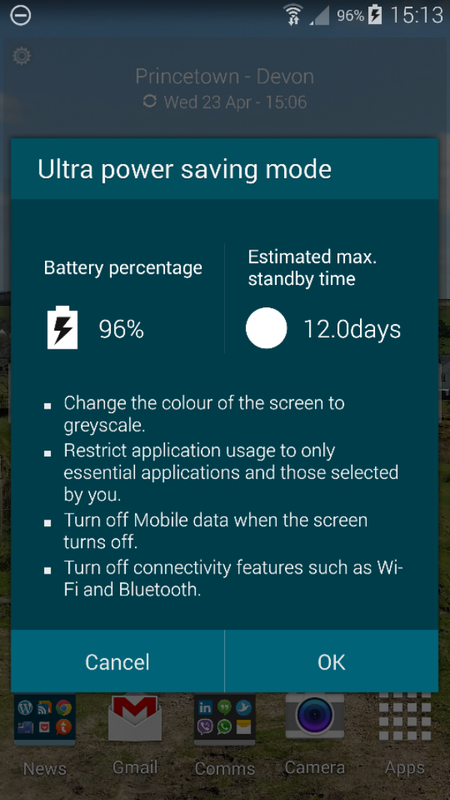 I was not at home when I hit 1%, so I switched to “ultra power saving mode”. Several hours later, I got home and still was at 1% battery. So my next test was to use the normal “power saving mode”. As you can see the usage obtained was considerably longer. I gave up in the end at 5%. It would have gone about another hour. Whilst the screen on time seems lower there was a lot of streaming and tons of background tasks on the go. So the next option is “ultimate power mode”. This turns the S5 into a near dumb phone and can last a huge amount of hours even on just one percent. So if you have the S5 you shouldn’t run out of battery until you get home with all the different power saving modes . 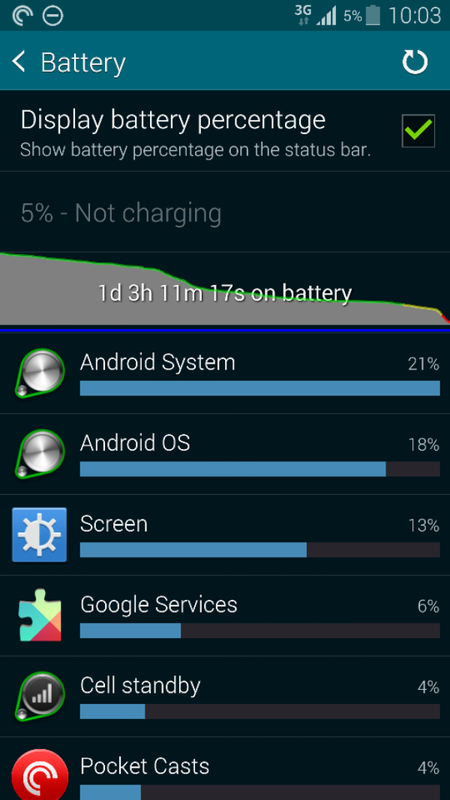 So with some major tweaking I got the following battery life yesterday. So is this a decent battery runtime. I’m sure Apple claim 8 hours and not 6. As a comparison, the Moto G has done 16 hours 31 mins and the battery is at 82%. Hardly fair to compare the iPad Air and iPhone 5S, but I am when it comes to battery life. Both got taken off the charger on Saturday at 7am. Both have been used pretty much non stop. FaceTime, gaming, web surfing, emails, twitter, background services galore. The iPad is at 64% battery. The iPhone 5S at 43%. And it’s only 4pm. I’ve tried to use the iPad Air a bit more as it’s battery life is absolutely incredible. I have no concerns that I won’t get to midnight with the Air and still have 30% battery free. And that is with really heavy use. However, I can see my iPhone 5S dying by 6pm. It has been used a lot and it has 227 apps installed with 47 apps setup with notifications. Just as scary is there are 58 apps which could also have notifications set in some way but are off at present. So it is likely my 5S will achieve 11 hours of which screen on time will be nearly 5 hours. 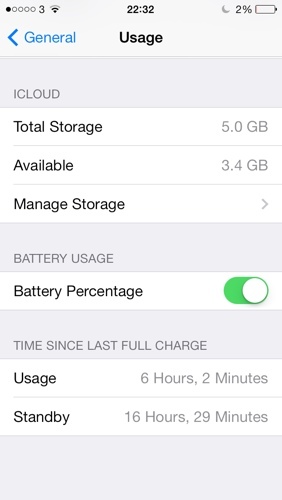 Now some of you might 5 hours screen on time is great, but the iPhone suffers from a short standby time as well. And I do wish this at least 4 times better. Do you agree?